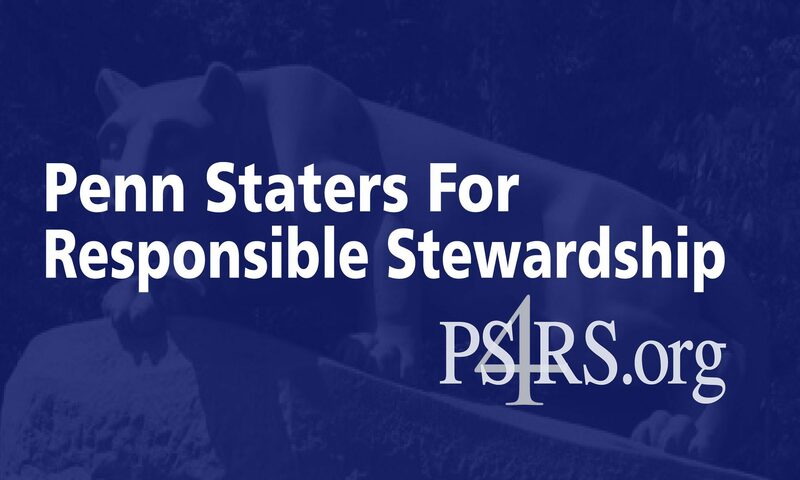 Penn Staters for Responsible Stewardship Launch Legal and Regulatory Task Force Grassroots organization will now provide ongoing legal review and guidance on Penn State Board of Trustee operations. FEBRUARY 27, 2012 —- Penn Staters for Responsible Stewardship (PS4RS), the organization formed to affect positive change within the University Board of Trustees, demanding transparent, trustworthy and moral leadership in the upcoming elections, is expanding its ever-growing watchdog role with the formation of a Legal and Regulatory Task Force. The Task Force, described by PS4RS Founder Michelle Murosky as “a natural next step for the organization,” will research legal issues associated with the actions or inactions of the Penn State Board of Trustees, as well as work to understand and recommend changes to the make-up and operation of the Board of Trustees. The Task Force will conduct its research and review wholly independent of the University, the Board of Trustees, and the Penn State Alumni Association. While the Board of Trustees has launched its own investigation, PS4RS does not believe that the investigation can be truly independent given the involvement of the Board of Trustees on the investigative team. The PS4RS Task Force will, as part of its review, seek access to and cooperation from the Board of Trustees. The first prong of the Task Force mission will be to provide guidance and recommendations to PS4RS on what, if any, legal implications exist as a result of the conduct of the current Board of Trustees. The Task Force will examine a variety of laws in connection with the actions, or inactions, of the Board of Trustees and Administration, both in advance of and subsequent to the events of November 2011. Upon completion of that review, the Task Force will make recommendations regarding action and, if appropriate, remedies to be sought as a result. The second prong of the Task Force mission will be to provide guidance and recommendations to PS4RS regarding proposed regulatory and structural changes in connection with the make-up and operation of the Board of Trustees. “There has been much confusion regarding the corporate governance of the Board of Trustees, the rules under which it operates, and the manner in which its members are elected or appointed,” explained Misitano. The Task Force will work to clarify those questions, provide a concise summary of the Board of Trustees operations, and create a library of the relevant governance documents. In addition, the Task Force will work cooperatively and collaboratively with other groups and individuals who are working toward a reorganization of the Board of Trustees, the manner in which members are selected, and the manner in which it operates. Finally, in conjunction with the efforts of the Task Force, PS4RS will launch a Legal and Regulatory Question and Answer section on http://www.ps4rs.org. That section will provide an interactive opportunity for members to raise and discuss legal and regulatory issues and questions related to the Board of Trustees, Administration, and the various legal proceedings currently pending.